Rates are horrible bloody things. They pay for cutting-edge, contemporary art galleries that a handful of the intelligensia patronize; and for men in orange vests to come and poison pretty plants on my property and other living things they swore they would not; and for the grandiose designs of idiots who think an old bus barn should have millions spent on its preservation as part of our 'unique heritage'. So reducing part or all of the burden of rates would be a wonderful thing to do. I have recently discovered there is an especial term for it. Derating. But how to achieve such a thing. Stand for council next year? No. My political ambitions are well and truly dead and buried. Then I stumbled across just the thing. A derator. Not sure what relevance cakes have got unless it is some oblique reference to Marie Antoinette's "Let them eat cake" which pretty much captures the attitude of those setting and imposing rates. Now I just have to figure out how it works. But for $2 what have I got to lose?? This is a nice way to start the day. A writer for the Financial Post is exhorting the whole world to adopt China's one child policy to stop global warming. It's utter balderdash but... the comments are worth reading. Then, as an antidote, if the comments haven't cheered you, read the Wall St Journal's Brett Stephens on the psychology of true believers. Brief and highly recommended. The Government has sent voters an early Christmas present a jump in ACC levies for motorists and wage earners. The increase will see motorists paying an extra $50 on average to register their vehicle to cover the rising costs of road accidents. National described the timing of yesterday's announcement as a "cynical pre-Christmas dump". In March this year (in perhaps a cynical pre-Easter dump) Nick Smith announced another $32 rise to apply from July 2009. Today, back to the cynical pre-Christmas dump, another hike is announced of a further $30 to apply from April 2010. From $204 to $316 - a 55 percent increase over 3 years. How much can people absorb? And I'll tell you what is really cynical. Scaring the populace by threatening large rises and expecting to bask in their relief and gratitude when you announce smaller ones. The head of Families Commission can't define whanau ora because she is "a middle-class white woman". But she can commit oodles of dosh to promoting it. I should have some sympathy because I am a middle-class white woman and asked the same question here last month. Remember the chart? But if you check the first comment on that post I think it is quite clear what whanau ora is. 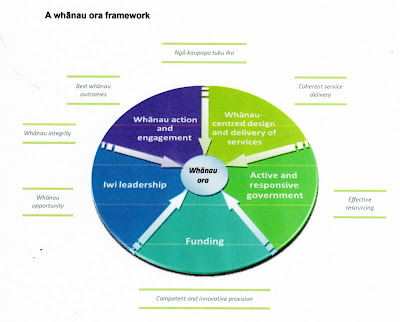 It is code for Maori taking control of the transfer of cash and services to whanau, hopefully, for their betterment. 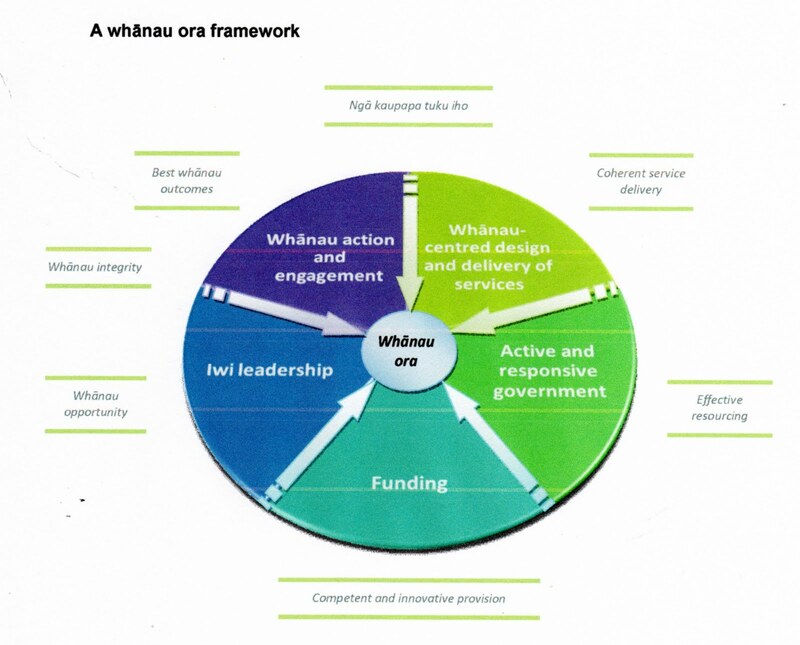 How far it will go (eg will Urban Maori Authorities control benefits?) is really the only aspect of whanau ora that is unclear. I was musing nevertheless about Jan Pryor's response and the difficulty some Pakeha have with Maori concepts, cloaked as they are in the mystery of another culture and language. I tried to imagine a similar scenario with a highly-paid, public servant who was a 'middle-class brown woman' saying that she couldn't define a Pakeha concept for that reason and found the idea highly unlikely. Quite preposterous actually. According to the Melbourne Age this morning, Victoria Police are experiencing problems with DNA analysis and have been forced to put several cases on hold and review others that may be affected. The flaw in the system involves the interpretation of results provided from new-generation DNA equipment that is more sophisticated than previous technology. Mr Overland said the machine, which has been operating since September, was accurate but the problem was with the statistical analysis of the results. ''Our statistical model has not kept pace with the new technology,'' he said. ''The science has outstripped the model. The Age last month revealed that the Director of Public Prosecutions had ordered a review of cases involving low-level DNA because of doubts over the system. The move followed the collapse of an armed robbery case in the County Court against two suspects after a police expert admitted DNA analysis could be unreliable. My interest was initially piqued because there seems to be a view, one expressed during the passage of NZ legislation to allow DNA sampling from non-convicted suspects, that DNA science is infallible. Victoria Police is the only Australian law enforcement agency using the new technology, but police in New Zealand have successfully introduced the sensitive equipment without similar problems. So, why? Why aren't the NZ Police having similar problems? How would we know if they were? A study using German data has shown a link between smoking and single motherhood. It would stack up here. Our research indicates that individuals who experience lone motherhood during childhood are more likely to smoke, and hence are at greater risk of poor lifetime health. This finding is clear cut according to models controlling for a wide range of observed confounding factors and holds regardless of the socioeconomic origin of the young adult and the measure of smoking behaviour. According to models which control for the unobserved factors that are shared within families, the findings are not as clear cut. We find a link between experience of lone motherhood and later-life smoking for young adults from the former West Germany, but there is a less consistent pattern for individuals from East German and Guestworker samples. In addition, there is variation in estimated effects according to how the lone motherhood arose and during which childhood stage. "A primer on US welfare reform" is the title of a paper by Robert Moffit, Professor of Economics at John Hopkins University, Baltimore. The tables I have used are from it. But first, some background from me. When New Zealanders think of welfare they think any welfare benefit - unemployment, sickness, invalid and DPB are the main ones. 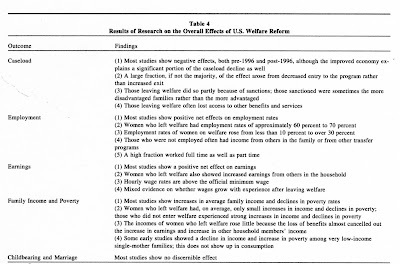 So when they hear about the US welfare reforms they assume the same areas are covered whereas, in fact, the reforms were largely focussed on family assistance, which covered mainly single mothers. Unlike NZ, the US never created a widows benefit but from 1935 single mothers could claim federal assistance (although states imposed their own rules about eligibility.) So the benefit that covered this purpose, Aid to Families with Dependent Children (AFDC) was effectively the equivalent of NZ's combined widow's and domestic purposes benefit. In the US unemployment insurance is an entirely separate matter funded through payroll taxes. Social Security (for low income elderly, sick and disabled) is funded through a separate payroll tax (which began at 2 percent but has grown to 12.4 percent). 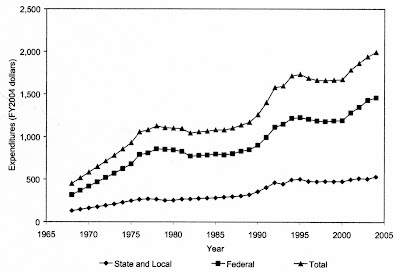 Supplemental social security (subjected to a spattering of less successful reforms) and AFDC, on the other hand, were funded through general tax revenues. It was also accepted that socially, AFDC was doing more harm than good. That then was the major target. AFDC was abolished and replaced with Temporary Assistance To Needy Families (TANF). Open-ended entitlements became temporary. (Which is what I have long campaigned for). 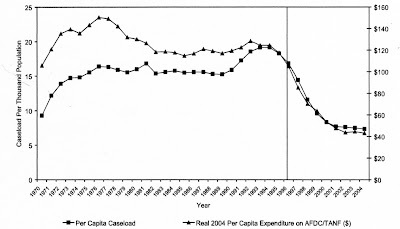 However, when we look at overall cash transfers, those the author includes as 'welfare' spending, the picture is very different. That is because spending on other programmes continues to grow. The following table details the nine largest programmes. So, many of those families that disappeared from the welfare rolls are, in effect, still on welfare. NZ opponents of the idea ask, what happens when people reach their time limits? US opponents claimed there would be mass poverty, people would die in the gutters. But often their homes, food and health needs are still paid for or subsidised and even a small amount of work will entitle them to an earned tax credit top-up. Plus states have a waiver to exempt a certain number from the limits. The significant difference is that families were expected to work and, this is the really important thing, their children learned the same. The Americans also had little truck with funding training and education schemes. The major principle (although states differed) was work first. 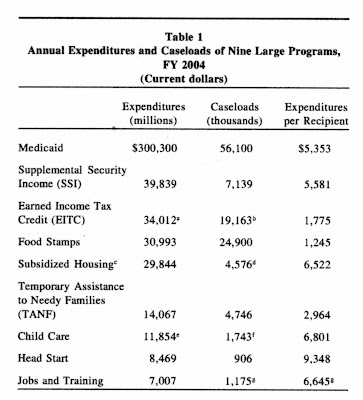 The author writes, "That the 1996 welfare reform was a success, in overall terms and on average, is almost universally accepted by policy analysts and researchers." Yes, there is good and bad, but on balance, most lives have improved. The following table summarises the findings of several studies. You will need to enlarge it to read it. But I want to highlight what I think is the crucial one. A large fraction, if not the majority, of the effect arose from decreased entry to the program rather than increased exit. That supports what I have long argued. That we have to change expectations. The easier part of reform is stopping people from putting themselves in the situation where they need welfare. For the life of me I do not know why it is so difficult for politicians to take this on board. Today's NZ Herald editorial says that the entire smacking debate was a waste of time. Well not quite. Because if it hadn't happened, smacking for any reason would be illegal. Let it be clear, a parent is perfectly entitled to deliver a light smack to a child throwing a tantrum, being obstinate or obnoxious or plainly misbehaving. There should be no disapproval shown by anyone witnessing reasonable force in these circumstances. So reasonable physical force against children is permissible. Isn't that where Sue Bradford came in? Over at The Hand Mirror readers are being asked to e-mail Breakfast TV advertisers and tell them their custom will be withdrawn if they continue to support Henry's show. Nothing wrong with that, although it is a bit rich how some loathe the free market yet are happy to exploit it when it suits. I will e-mail the same list to say I don't have a problem with Paul Henry and I won't be withholding any existing or potential custom from them if they continue to patronise Breakfast. Women over all make up 82% of the claimants; and while it is known that Maori women are heavily represented in this percentage, ACC is currently unable to confirm what the actual ethnicity breakdown is. But as this has not happened she is claiming racial discrimination. Well, she didn't try very hard to get the statistics. They are available on-line. 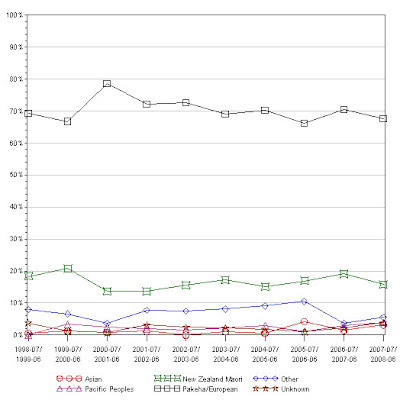 In the 2007/08 year there were 240 (14 percent of total) active Maori sensitive claims (average cost $8,692), 28 (2 percent) Pacific ($7,929) and 1,268 (73 percent) Pakeha/European ($11,737). This chart depicts new claims. “Since Maori women are more likely to be affected by the changes to ACC, why are they the last to be consulted” questions Elizabeth Bang. Because Maori women are not more likely to be affected by the changes. One is left wondering whether these two groups are talking to one another at all. No argument from me that Maori women are more likely to suffer sexual victimisation as adults (less like to suffer from childhood sexual abuse) but in terms of current claims, they are not over-represented. A post at NotPC about form filling ad infinitum has prompted me to recall how a few years back Robert was admitted to A&E with suspected appendicitis (thanks to our diligent and sharp-eyed GP whose receptionist was overwhelmed by my ringing the surgery later to thank her - apparently a very unusual occurrence). And I think I may have missed one or two like permission for a drip to be administered, but I'm not sure. The staff were kind and reassuring. But the length of time everything took, during which Robert, then quite young, was, for what seemed like hours, in severe pain, vomiting and dehydrating but not allowed to imbibe any fluid due to the pending operation, must have been due, in some part, to all the bureaucratic processes. Have you caught up with Sir Paul McCartney's latest brainwave to fight global warming? I don't think he is trying hard enough. Why stop there? The possibilities are just mind-boggling. And we could all go and live in yellow submarines too. Spending on prisoner health - and your point is? Shock, horror. Taxpayers fund bill of $22 million for prisoner health. Convicted criminals have received more than $22 million in taxpayer-funded healthcare while in jail in the past year – nearly three times more than five years ago. Figures obtained by The Dominion Post under the Official Information Act show the average annual health spend per prisoner in the year to June was $2752. But how does that compare to non-prisoners? Total health spending forecast by Treasury for 2009 was $12.396 billion. Divided across 4,316,000 people that's $2,872 each. More than was spent on prisoners. Where's the story? The only conclusion I can draw is that prisoner health has been chronically under-funded in the past. Under Labour, no less. Or is the writer simply attempting to fuel resentment that anything at all is spent on prisoner's health?